CRIME, GUNS, AND VIDEOTAPE: Did Roland Burris Lie While Under Oath? Did Roland Burris Lie While Under Oath? Did this fine specimen of Chicago Democratic Machine Politics commit perjury? Is he just another criminal? Can anyone succeed in Illinois Democratic politics without being a total political whore and criminal? Senator Burris, please step forward and spill your guts! It looks like we have one more, close confidant that can tell us about Barack Obama’s corruption activities. Will Obama be able to keep the bones in his closet quiet? Will Obama be the first US President jailed? Stay tuned folks, the fun is just beginning! That shot is from the Harrison Ford movie The Fugitive. 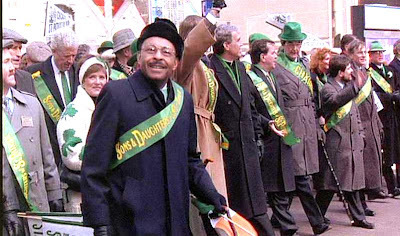 The parade became part of the film. I'd rather have a clip from his "perp Walk." Illinois is a total disgrace, Chicago is the cesspool of national corruption and greed in politics. As a resident I am sickened by all of it. California Highway Patrol Officer Kills Husband. Will This Be The Currency Of Hope And Change? Is there a Second Spector Mistrial Brewing? Feminine Protection Of A False Sense Of Security? Armed Home Invaders Caught On Tape! Rookie Mistakes Or, I Won And I Am In Charge! Get Ready For The Bloodbath. What Form Of Government Do We Have Now? Here is A Real Bailout for The American Economy!